Q. How do I find articles from specific publications or from a citation? 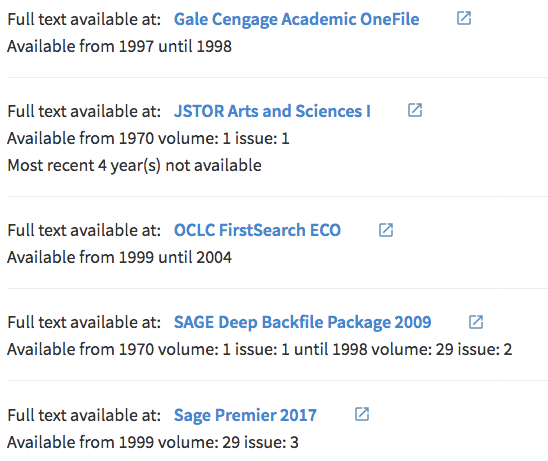 If you have a citation from a syllabus or bibliography, or you want to see all the articles from a specific publication, you can check if the libraries have articles from a specific journal, magazine, or newspaper. To do this, click on “Journals” underneath the search box on the libraries’ website. Search for the title you're looking for, then click on it from the list of results. Choose a database based on what years you’re interested in. What you see when you click will depend on the database, but usually you’ll come to a page that will allow you either to search within this publication - for example, for an author or article title - or to navigate to a specific issue or date.